Warmer Winter Ahead for Bangor? Winter in the Bangor area could be warmer than normal, according to the recently released winter weather outlook from the National Weather Service's Climate Prediction Center. That may come as good news for all Mainers who remember last winter, whose cold temperatures and snowy conditions dragged through March. NWS forecasters are predicting that a weak El Niño -- the prolonged warming of Pacific Ocean surface temperatures -- could contribute to above normal temperatures in western U.S., Alaska, Hawaii and New England. Vic Nouhan, a meteorologist with the National Weather Service in Caribou, explained that the weak El Niño could contribute to a weather pattern that prevents cold Arctic air from penetrating deep into the region, as was the case last winter. While temperatures might be on the warmer side, the amount of winter precipitation is expected to be average. Last winter, Bangor got about 75 inches of snow. The average is about 66 inches. The National Weather Service outlook is much different than the snowy, cold forecast released in August by forecasters at the Farmers' Almanac. That early forecast, however, did leave open the possibility of an El Niño contributing to a milder winter in the nation's norther tier. 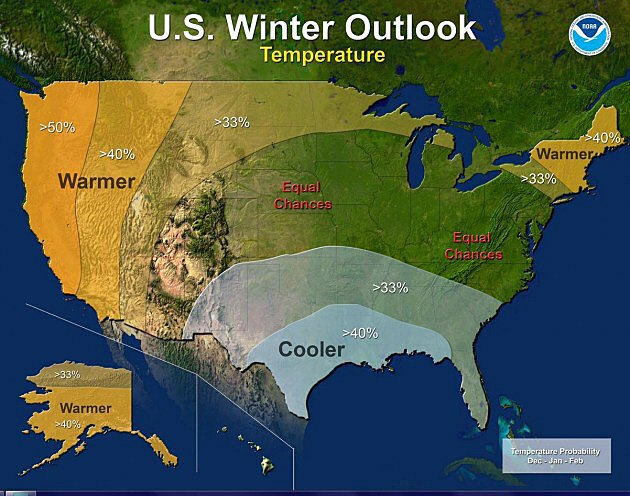 Source: Warmer Winter Ahead for Bangor?